I love these drops of water on stems, leaves and petals. 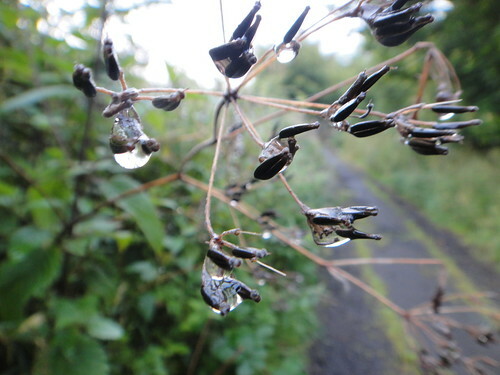 They are like little lenses to see the world through, little prisms or jewels decorating the hedgerow. I’ve no idea what this is. It was lying in the middle of the path right in front of me. 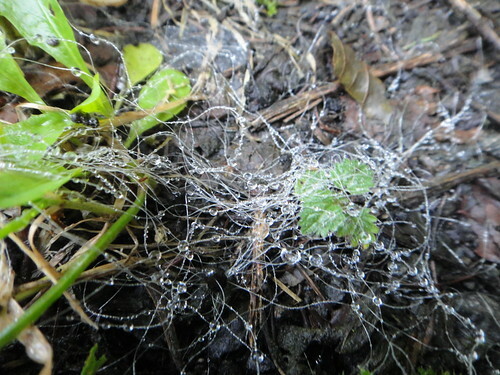 Like gossamer, a little tangle of filaments in a small bundle on the ground. I guess it’s the creation of a spider of some kind but I’ve never seen anything like it. See the dew drop, just to the top right? What I didn’t notice as I took the photograph was that the creator of this web wasn’t finished. See her right in the middle? It looks to me that the inner spiral is not yet complete. I’m not a golfer, but what this photo made me think was, if this is where the ball landed, this is where the golfer will have to play it. The rules state you play the ball from where you find it. No point moaning or groaning or wishing it was somewhere else. It is where it is and you have to play it. Thing is, you have to start from where you are. You can wish you were somewhere else. You can even wish you were SOMEONE else! But that won’t help. Because, actually, it turns out, there’s a lot of grief in wishing it were different, or resenting that it isn’t different, from what it is. You have to take the play – HERE and NOW. You can only make choices in the PRESENT. There’s no joy in living in the world of past hurts and grievances or in the world of future what ifs and maybes….. In “If you go down to the woods today…” post I pointed my camera at the forest floor. In this I’m pointing it up from the forest floor…. Yesterday I went wandering in a forest which has grown up at the foot of an old quarry. Got lots of lovely shots, but these two completely took me by surprise! I spotted the glint of a sparkle under a thick growth of ferns so pushed my camera under the leaves and clicked. Look what I found! A little pool of water beautifully reflecting the forest above and around..
Consciousness requires the joint operation of brain, body, and world. Indeed consciousness is an achievement of the whole animal in its environmental context. The subject of experience is not a bit of your body. You are not your brain. The brain, rather, is part of what you are. Brains don’t have minds; people (and other animals) do. …the skull is not a magical membrane; why not take seriously the possibility that the causal processes that matter for consciousness are themselves boundary crossing and, therefore, world involving? …our body is ours – the place where we feel and the means by which we act – insofar as the current of activity that flows toward the world passes through it. Science takes up the detached attitude to things. But from the detached standpoint, it turns out, it is not possible even to bring the mind of another into focus. From the detached standpoint, there is only behaviour and physiology: there is no mind. ..you can’t do biology from within physics. To do biology, we need the resources to take up a nonmechanistic attitude to the organism as an environmentally embedded unity. When we do that – and now we come to my critical claim – we also secure the (at least) primitive mentality of the organisms. The problem of mind is that of the problem of life. What biology brings into focus is the living being, but where we discern life, we have everything we need to discern mind. …once you see the organism as a unity, as more than just a process, you are, in effect, recognising its primitive agency, its possession of interests, needs, and point of view. I feel this is crucial if we are to achieve a better understanding of these big issues of life, mind and consciousness. We have to see people as whole organisms in constant exchange with their environment. There’s something inherently inhuman about the attempts to reduce biology to physics, or the attempts to reduce human beings to physiology and behaviour. We are partly constituted by a flow of activity with the world around us. We are partly constituted by the world around us. Which is just to say that, in an important sense, we are not separate from the world, we are of it, part of it. Susan Hurley said that persons are dynamic singularities. We are places where something is happening. We are wide. Once in a while, I get shocked into upper wakefulness, I turn a corner, see the ocean, and my heart tips over with happiness – it feels so free! Then I have the idea that, as well as beholding, I can also be beheld from yonder and am not a discrete object but incorporated with the rest, with universal sapphire, purplish blue. For what is this sea, this atmosphere, doing within the eight-inch diameter of your skull? (I say nothing of the sun and the galaxy which are also there.) At the center of the beholder there must be a space for the whole, and this nothing-space is not an empty nothing-space but a nothing reserved for everything. I hope I have convinced you that there is something perverse about the very idea that we are our brains, that the world we experience is within us. We don’t need to have the world within us: we have access to the world around us; we are open to it. I take this to be the import of Bellow’s language in this chapter’s epigraph.